On Montague Street in Downtown Brooklyn lies Lichee Nut, a Chinese restaurant that offers reasonably priced foods. It is accessible and conspicuous as its bright red sign can be seen easily from a distance. Their décor is simple yet comforting. The service is fairly good and inexpensive, but as one can notice, the place needs to change certain things. The place got its name from Lychee Nut Desert and Bubble Tea that they serve. With their good food I would always go to Lichee Nut even if their service need some improvement. Lichee Nut opens seven days a week from 1l: 30am to 9:30pm on Thursdays. On Fridays and Saturdays, the busiest days of the week, they close at 10:30pm and on Sunday 1:30pm to 9:30pm. From 11:30am to 3:30pm, it offers a special low-price lunch menu from $4.95 to $6.95, which comes with soup, ice tea and fortune cookies. Online or phone orders are delivered for free for orders over 10 dollars .The delivery service goes throughout Brooklyn, from Brooklyn Heights to Dumbo, and even to colleges like College of Technology, LIU, and NYU Polytechnic. During a lunch break, students can take 10 minutes to walk to the Lichee Nut to get good reasonable priced food especially from City Tech. 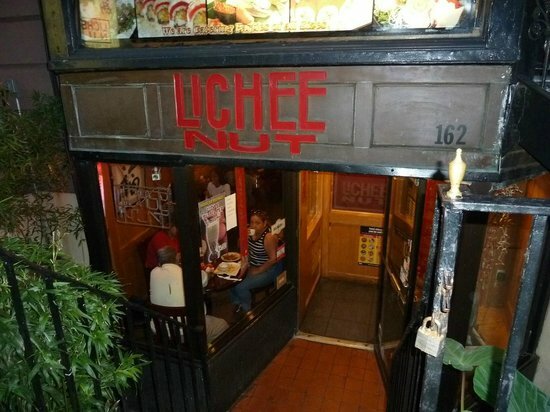 Known as Brooklyn’s freshest and finest Chinese fare, Lichee Nut serves East Asian traditional and exotic cuisine. One popular dish is Spicy General Tso’s Chicken, which I had for lunch. It is a sweet dish with a kick of heat in the back of your throat, and comes with fried rice and ice tea. I had the Spicy General Tso’s Chicken three times and it was consistent every time. The fried rice was fluffy, tasty and fresh. The servers brought out my food as fast as I order it, but ordering a takeout took a little longer than I thought. For only $6.50 you get a good amount of food. The servers greet people as they enter and sit them right away. They give out hot tea and fried wonton noodles with sweet and sour sauce as appetizer. The servers have accents but their accents are not strong enough that you can’t understand them. There was one thing about the service that caught my attention: “They brought the check out before customers could take a first bite” (anonymous user, delivery.com) right after they put down the food. It feels like they are trying to kick out people even before they eat. If someone wants to order more food the server would have to take the check from the table, which interrupts guests when they eat. One experience that I had with the service that had never happened before was one of the waiters complained about why he didn’t get a tip from us but he wasn’t even our waiter. The other three time that I have eaten there not problem has happened. When this situation with the tipping of the waiter happened, it shocked my friends and I because we have been here before and nothing like this has happened. I might go back to the Lichee Nut because in how good their food is but next time I’ll take it to go so I don’t need to deal with their waiters. Lichee Nut has a simple décor, from wooden interior walls and furniture to cherry-color wood tables and chairs that contrast the walls. They have comfortable seating which enhanced the dinning experience. Its ethnic decorations provide exotic cultural feel to it. Background Chinese folk music relaxes the costumers as they enjoy their food. “The food and atmosphere are a cut above your average Chinese take-out place”(Google user, Licheenut.com). even though they’re price is as low as any other Chinese restaurant. People say “you will probably miss locate Lichee Nut if not for the bright red sign outside” (Tfloew, tripadviser.com). But if that is true the interior makes up for the lack of its exterior. Over all the Lichee Nut is a restaurant worth trying because of its cheap, fresh food and service is alright. Its simple interior and unique music make a unique, calming ambiance that makes people appreciate the food. It is better than most nearby Chinese restaurants in the area. For students, Lichee Nut is definitely a good place to go because it is accessible and inexpensive and you can get a lot out of your buck. Tfloew. “Very good, inexpensive, close to the Promenade”. 18 March 2013. Web. This entry was posted in Chinese, Local Grub, Sit Down. Bookmark the permalink.